LOS ANGELES, CA (May 1, 2014) – Metro-Goldwyn-Mayer Studios (MGM) and Twentieth Century Fox Home Entertainment present ROBOCOP, arriving on Digital HD May 20 and on Blu-ray, DVD and VOD June 3. Directed by José Padilha, ROBOCOP stars Joel Kinnaman, Gary Oldman, Michael Keaton, Abbie Cornish, Jackie Earle Haley and Samuel L. Jackson. In ROBOCOP, the year is 2028 and OmniCorp – the world’s leader in robot technology – sees a golden opportunity to reap billions for their company. When Alex Murphy (Joel Kinnaman) – a loving husband, father and good cop doing his best to stem the tide of crime and corruption in Detroit – is critically injured, OmniCorp grabs their chance to build a part-man, part-robot police officer. OmniCorp envisions a RoboCop in every city and will stop at nothing – no matter the cost to Alex – to make sure the program succeeds. But OmniCorp never counted on one thing: there is still a man fighting inside the machine. The film is written by Joshua Zetumer and Edward Neumeier & Michael Miner, and produced by Marc Abraham and Eric Newman. Metro-Goldwyn-Mayer Pictures and Columbia Pictures’ released ROBOCOP theatrically on February 12, 2014. 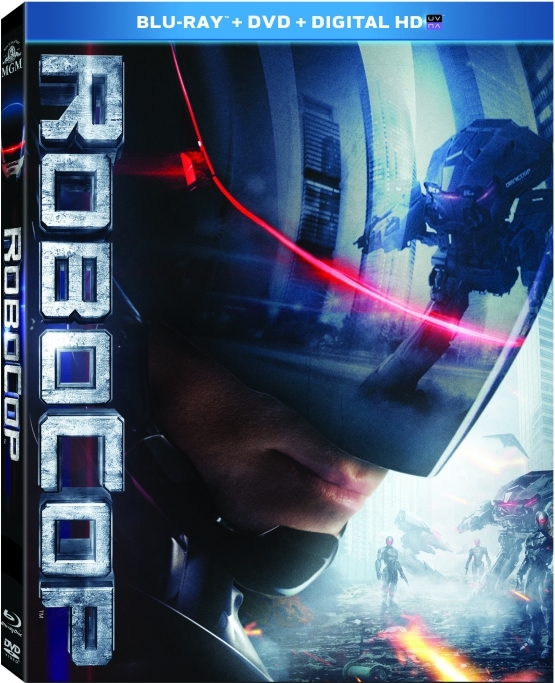 The ROBOCOP Blu-ray is charged with nearly an hour of extra features and featurettes, taking fans behind-the-scenes of OmniCorp to witness the future of law enforcement, learn the secrets of director Jose Padilha, and explore the making of the film. Metro-Goldwyn-Mayer is celebrating 90 years as a leader in the entertainment business and as an innovator in the industry. Today, MGM is an entertainment company focused on the production and distribution of film and television content globally. The company owns one of the world’s deepest libraries of premium film and television content. In addition, MGM has investments in domestic and international television channels. For more information, visit www.mgm.com.